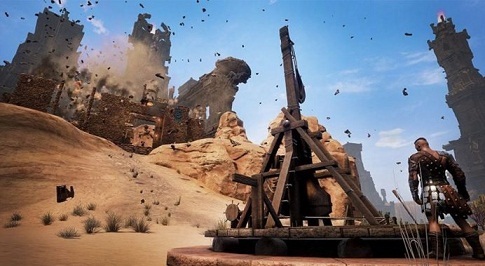 The latest update 23 for Conan Exiles brings you the possibility to build a Trebuchet. With this siege weapon you can attack and destroy your enemies' fortresses much faster. With Trebuchet heavy shells can be thrown over hundreds of meters. These have now found their impact in the barbaric world and you can take your personal trebuchet into the battle. Save your explosive vessels, because there are now better ways to destroy a fortress in Conan Exiles. You must place the trebuchet in a fixed place and you can start the attack. But make sure that this site is well chosen, so that the other players don’t simply make short process with your machine. In addition to this weapon, changes are also made to the game through Update 23, but the siege is definitely one of the most important one. If you have all this together, it is finally done. Altogether you need 600 wood, 30 wooden boards, 25 bricks, 25 Twine and 39 iron reinforcements for your trebuchet. Again, the location of your trebuchet is very important as it is not movable. The ammunition can consist either of explosive vessels or produce ammunition of 25 stones and ten twines directly in the machine. You must also load some stones as a counterweight in your Trebuchet. This is quite demanding, since you have to make the adjustment yourself. To adjust the weapon counts the trajectory and range. You can also rotate them to the left and right. Just try it out and make sure no enemy is too close to your Trebuchet. It is always advisable to take some friends with you during sieges, so that you can keep the shot longer.